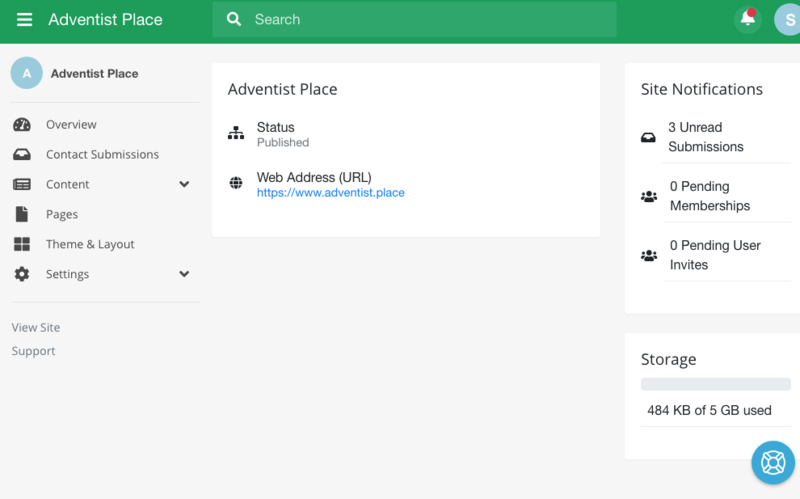 When you log into https://dashboard.adventist.place you first arrive at the main Adventist Place Dashboard. See a list of Sites you have access to. Add Sites to your list, if it's not listed already in the centre of the screen, by clicking blue Add Site button. Go to a Site’s editing/administration area by clicking on the name of an added Site. 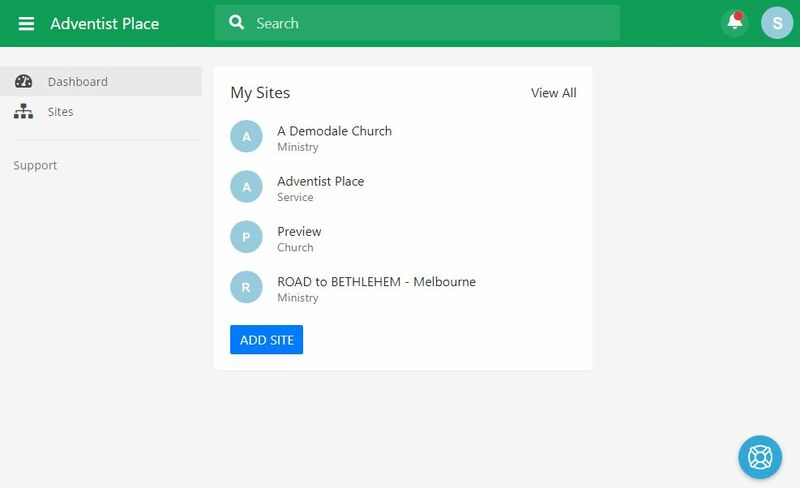 Return to Adventist Place Dashboard at any time by clicking ‘Adventist Place’ words up the top left corner of any page. Show/hide the Main Menu by clicking the three horizontal lines up the top left (Note: the Main Menu will initially be hidden if on a mobile/tablet by default). View Notification Alerts by clicking the bell icon up the top right. A red number will display when there are notifications which have not been viewed. Click View on a notification will take you to more information. Click the cog icon to view a menu where you can clear all notifications. Search bar across the top searches for Sites you have access to. Support (where you are now) can always be accessed to help you when you get stuck. You can always find this support site via the Support link under the Main Menu in the Dashboard, OR by clicking the round blue help icon down the bottom right of each Dashboard page, where you can then search via keyword for what you need help with.